What Should I Do With My IBM Shares? On October 28, 2018 Seeking Alpha’s News Editor Brandy Betz announced the following IBM acquires Red Hat for $34B, which I am sure left many investors scratching their heads as to why IBM (IBM) would do such a thing? In this article, I will not discuss the various operations of the proposed merged company and how each is doing, as you can read many such articles on Seeking Alpha, both pro and con. What I will simply do is a quantitative analysis of IBM’s results on Main Street and then relate them to what an investor should do on Wall Street, using zero emotion. Since 2013 IBM has struggled on both Main Street and Wall Street and this under performance has forced many investors (including legendary investor Warren Buffett) to cut and run from IBM and sell their shares in disgust. This has occurred for the simple reason that IBM’s management has struggled to grow the company’s revenue. Over the last four decades, I have learned one very important lesson as an Analyst and that is that investors on Wall Street hate negative revenue growth more than anything else. 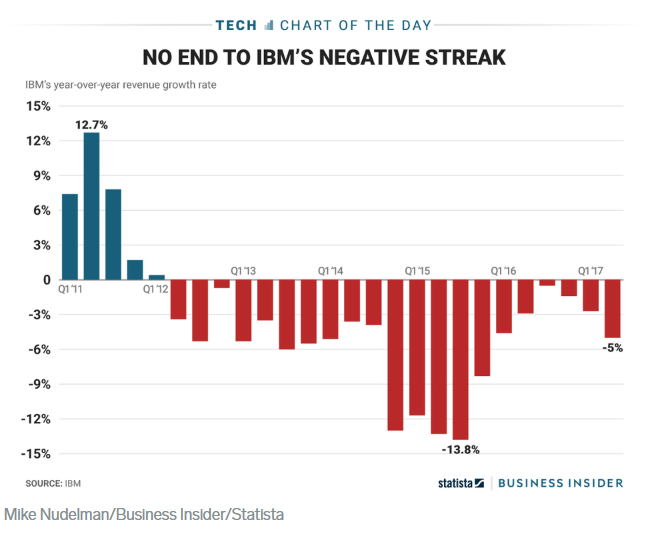 IBM has been the poster child of negative revenue growth over the past five years , achieving 21 consecutive quarters of negative revenue growth, before having the streak recently end. This negative revenue growth rate has unfortunately forced IBM’s management to go outside of the company (in its acquisition of Red Hat), in order to find revenue growth, as it has tried internally for 21 consecutive quarters before eventually doing so. 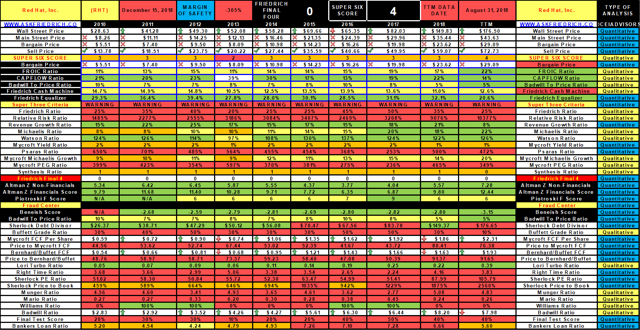 Here is our Friedrich datafile and quantitative chart (not technical chart) of Red Hat (RHT). So in hunting for revenue growth, IBM ended overpaying by a large margin for Red Hat. The white line you see in the chart above is the Wall Street price for Red Hat and the yellow line is our Friedrich algorithms Main Street price (or what the algorithm believes the company is worth to a private buyer on Main Street if s/he were to buy the entire company per share) At $190 offered per share in cash for Red Hat, we believe that IBM paid over 4 times what the company is really worth. So in effect the decision making at IBM has gone from bad to worse. Let us now go and analyze IBM and then see what our Friedrich algorithm has to say about what you should do with your shares. In analyzing IBM, we will present some unique ratios that our Friedrich Investing System uses and will present a real-time quantitative analysis that will demonstrate the power of free cash flow in the investment process. In doing so, we will also teach everyone how to analyze one’s portfolio holdings on Main Street vs. Wall Street. At the same time, we will explain how the methodology involved in this analysis came about. Main Street is where IBM operates and Wall Street is where its shares trade. The IBM shares that one can purchase on Wall Street are traded publicly on exchanges and the company has little control over how each share will trade. IBM is required to release its earnings reports each quarter and, from time to time, it also provides press releases to its shareholders (and the general public) giving updates on how its operations are doing on Main Street. Main Street is where IBM invests in its own operations and sells to its customers. How well the CEO of IBM and its management do in selling those products determines how profitable the company will be. Wall Street then reacts based on the success or failure of management to meet its goals. Main Street and Wall Street are thus interlinked, but because anyone with a computer (or even just a smart phone), an internet connection, and a brokerage account can buy or sell any stock at any time, expertise is not a requirement in order to invest on Wall Street. Having noticed this problem some 35 years ago, I spent the last three decades building an algorithm called Friedrich. Our algorithm was designed to assist all investors (both Pro and Novice alike) and give them the ability to quickly compare a company’s Main Street operations, to its Wall Street valuation (Overbought or Oversold condition). Friedrich can do this on an individual company basis or assist users in analyzing an entire index like the S&P 500, an ETF, Mutual Fund, or individual portfolio with the use of our Portfolio Analyzer. I recently did so when I compared Apple (AAPL) to the S&P 500 Index (SPY) Apple Vs. The S&P 500: Which Is The Better Investment? Many years ago, while reading Berkshire Hathaway’s ( BRK.A) ( BRK.B) 1986 letter to shareholders, I discovered a ratio, which Mr. Buffett called “Owner Earnings,” or what we may consider to be Mr. Buffett’s version of FCF, or “Free Cash Flow.” To my amazement, in that little footnote, Mr. Buffett explained how to use it and basically states that it is one of the key ratios that he and Charlie Munger used in analyzing stocks. In that article, he defined the term “owner earnings” as the cash that is generated by the company’s business operations. So, let us begin our analysis and at the same time try to teach everyone how to do a similar analysis on one’s own portfolio. In analyzing IBM’s Price to Bernhard Buffett FCF ratio, we must first adjust IBM’s Wall Street Price to account for its debt using our Sherlock Debt Divisor. Below is a detailed definition of that ratio and how we use it. A major concern that I have these days in analyzing companies is the debt burden relative to its operations and whether management is abusing this situation by taking on more debt than it requires. Debt, when used wisely, allows for what is called leverage, and leverage can be extremely beneficial within certain parameters. On the other side of the coin, the use of debt can also be excessive and put a company’s future in jeopardy. So, what I have done to determine if a company’s debt policy is beneficial or abusive is to create the Sherlock Debt Divisor. What the Divisor does is punish companies that use debt unwisely and rewards those who successfully use debt as leverage. How do I do this? Well, I take a company’s working capital and subtract its long-term debt. If a company has a lot more working capital than long-term debt I reward it but punish those whose long-term debt exceeds its working capital. So, if this result is higher than the current stock market price, then leverage is being used and the more leveraged a company is, the worse the results of this ratio will be and the less attractive its stock will be as an investment. Thus, having successfully defined the Sherlock Debt Divisor, we need the following four bits of financial data in order to calculate it for IBM. TTM (trailing twelve months) is as close to real-time data as we can get, based on when each company reports. The current analysis is taken from the IBM’s September 30, 2018 filing with the SEC (except the Market Price per share). Since IBM has more Long-Term Debt vs. Working Capital, we, therefore, must punish it and use the new $146.73 as our new numerator in all our calculations. Now, if one goes to our FRIEDRICH LEGEND (on what is considered a good or bad result), you will notice that our result of 20.13 is considered average where anything under 15 is considered excellent. We last ran our data file for IBM on December 15, 2018, and our Friedrich Algorithm gave a recommendation to our subscribers that IBM is a “Hold” as our Friedrich Data File and Chart below shows. There you will also find the last ten years of IBM’s Price to Bernhard Buffett Free Cash Flow results. 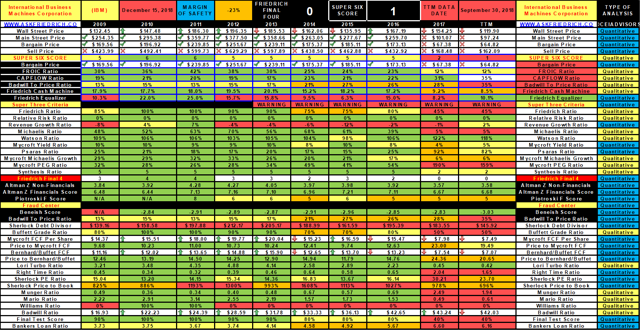 Now, if one goes to my FRIEDRICH LEGEND again (on what is considered a good or bad result), you will notice that our result of 12.3% is considered good and tells us that IBM produces $12.30 in forward free cash flow for every $100 it invests in total capital employed on Main Street . On Main Street, IBM is doing ok, while on Wall Street it is considered a hold. Going forward, IBM in our opinion bought Red Hat in order to help it achieve a consistent positive revenue growth rate, but that it way overpaid for that privilege. Not only that, but it paid 10.77 times Red Hat’s TTM (Trailing Twelve Months) revenue and 118 times its TTM earnings. Those are dot.com boom and bust numbers and will only make matters worse at IBM. Once the merger is complete we will come back and write another article about the combined firm and you will probably find that though revenue growth maybe positive, every other result will be greatly reduced. The WARNINGS that you see in the IBM Datafile above are given when a company has one of three things happen to it. Well, IBM has overcome its 21 consecutive periods of negative growth and may further do so when merging operations with Red Hat, but it will probably increase its Goodwill and Intangible assets substantially and that we see as a serious “Badwill to Price” negative. As you can see from our Red Hat Datafile at the beginning of this article, that Red Hat has had WARNINGS over the entire 10 year period under analysis and that is because it has always sold above its sell price. The reason for this is because its revenue growth has been excellent and that is what Wall Street loves more than anything. All I can say is that Warren Buffett is probably very happy he sold his entire stake in IBM prior to this disastrous merger being announced. In our opinion IBM dramatically overpaid for Red Hat and it should come back to haunt them sooner than later. We also recommend that investors follow Warren Buffett’s lead, as management keeps creating more problems for the company with every attempt they make to save it. Management’s days in our opinion are numbered. At Friedrich Global Research, we stick to the numbers. We do analysis like what you saw in this article, but for 20,000 stocks from 36 counties around the world. We also provide model portfolios ranging from ultra conservative to aggressive growth, so you can apply our research to your investing easily. Interested? Go here to sign up today. Additional disclosure: This analysis is not an advice to buy or sell this or any stock; it is just pointing out an objective observation of unique patterns that developed from our research. Factual material is obtained from sources believed to be reliable, but the poster is not responsible for any errors or omissions, or for the results of actions taken based on information contained herein. Nothing herein should be construed as an offer to buy or sell securities or to give individual investment advice.